The Festival d'Avignon, now in its 66th year, is a major annual arts festival held in venues around the French city every July. This year the influence of the teachings of Lecoq was particularly prevalent in the programme. At the close of its first week, the 66th Festival d’Avignon is already proving memorable. The annual festival of French theatre invited for the first time in its history a British company to perform in the “holy of holies”, the Papal Palace that doubles as centre stage of the “In” program, while the “Off” section makes room for a record number of shows: over 1,200. The pavements of this 12th century city are overflowing with posters, prospectuses and impromptu performance pieces meant to lure the public out of the Provençal sun and into the often makeshift venues. This year’s festival celebrates the centenary of its founder, Jean Vilar, and his vision of popular theatre remains at the centre of this month-long event, but Avignon Week One was also a silent tribute to the teachings of an even more influential theater pedagogue, Jacques Lecoq. Lecoq’s theories and teachings have been a modernizing force of contemporary theater, evolving its forms and language – in Britain in particular. Great teachers live on through their students and even more so in the case of Lecoq; the list of those who have passed through the doors of the school he founded in Paris in 1956 is an impressive Who’s Who of contemporary cinema and theatre: Geoffrey Rush, Yasmina Reza, Ariane Mnouchkine, Simon McBurney, Luc Bondy, Dario Fo, Steven Berkoff, Julie Taymor. The list continues. Lecoq’s heritage vibrates through the “In” program of this year’s festival, both through the choice of McBurney as Associate Artist and the presence of other former Lecoq students: McBurney’s Complicite, the South African artist, William Kentridge; the Swiss director, Christophe Marthaler and siblings Heidi and Rolf Abderhalden of Bogota’s Mapa Teatro. Yet Lecoq remains an unidentified object in France where his physical and organic approach to telling stories on stage contrasts sharply with classical practice at state schools. A physical therapist who came to theatre via the mime of Jean Dasté and Jacques Copeau, he developed a three-pronged pedagogy based on movement, improvisation and self-taught, small-group instruction known as autocours. Students at the École Jacques Lecoq are lured by his rigorous, unconventional training methods which involve intensive observation of the natural world and the development of an individual corporal language to express it. Receiving no funding and not much in the way of recognition from the French government, the school is no less a Mecca for students from over 30 countries who must submit to fierce competition to enter the halls of the former boxing gym where the school has resided since 1976. Despite McBurney’s prescence as the festival’s Associate Artist, the invitation extended to so many Lecoq-trained artists this year was more accidental than deliberate, reflecting the intention of Festival directors Vincent Baudriller and Hortense Archambault to explore the shape of contemporary European theater. The simultaneous presence here of a generation of Lecoq graduates was nevertheless an occasion to reflect, through public interviews, film screenings and the performers’ own work, on the vision and heritage that brought them here. Invited to the Cour d’Honneur of the Papal Palace, McBurney’s Complicite is the undisputed star of the festival, with an ambitiously faithful adaptation of Mikhail Bulgakov’s enormous novel, The Master and Margarita, set in a Stalin-era Moscow terrorized by a malicious Devil. The London-based Complicite is largely responsible for the spread of Lecoq’s teachings in Britain; it’s signature genius for creating entire worlds out of a few household objects has spawned many aspiring imitators, though none has matched either McBurney’s creativity or the company’s impressive record of over 30 ground-breaking shows in less than two decades. 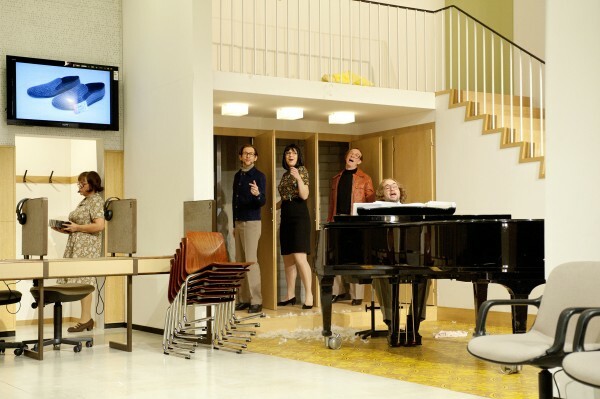 One who does, in the German-speaking world, is Christophe Marthaler, who has brought the Festival’s most acclaimed show so far: an ingeniously funny, broad remake of My Fair Lady set in a 1960s language laboratory. With over 60 shows to his credit, Marthaler has become a widely popular, regular visitor to French stages. An accomplished classical musician, he blends music and farce to create strangely endearing worlds of off-kilter office employees teetering on the edge of existential chaos, as he does again with the joyous Meine Faire Dame, Ein Sprachlabor. 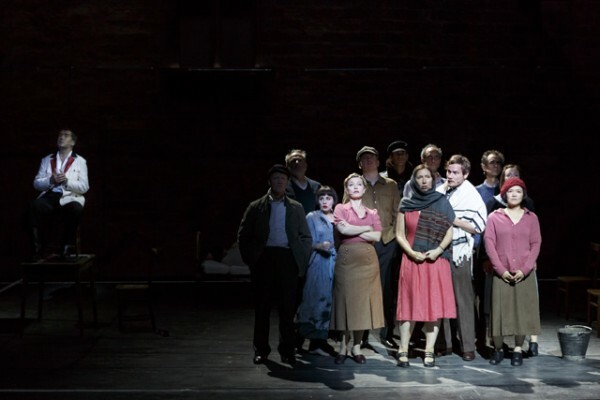 One of the Festival’s two other Lecoq-trained guests is William Kentridge, a plastic artist of international renown, thanks in part to his collaboration with Johannesburg’s Handspring Puppet Company, which created the puppet stars of the National Theatre production of War Horse, now on Broadway. Kentridge’s grainy, animated charcoal drawings have provided the setting for haunting works like the marionette play, Woyzeck On The Highveld, but his contribution to this year’s Avignon Festival is the most disappointing of the work brought by Lecoq artists. Although aided by a 20-strong cast of dancers, singers and musicians, Refuse the Hour is a scholarly exploration of time and physics that fails to connect its many dots. On another register completely are the ethnographic concerns of Heidi and Rolf Abderhalden’s Mapa Teatro; the compay traveled to Guapi, Colombia to study an annual festival known as Los santos innoncentes, inspired by Afro-Caribbean carnival and the Biblical story of the massacre of the innocents. Their play, which plunges headlong into the mysteries and practices of a centuries old ritual which also serves as a cathartic counterpoint to the violence wreaked today by paramilitary forces in the region, proves Mapa Teatro to be the most politically conscious of Lecoq’s students here. Who better to judge this than a city as absorbed by theatre as Avignon.